Posted on Fri, Feb 17, 2012 : 1 p.m. Here are the five most-viewed sports stories on AnnArbor.com from Sunday to Friday afternoon. With Valentine's Day mid-week, a love song to Denard Robinson certainly topped the list. Former Michigan defensive lineman Mike Martin, above, has a list of goals he hopes to meet at next week's NFL Combine. He's keeping most of them close to his vest, but shared one: Breaking the record of 49 reps on the 225-pound bench press. 1. WITH VIDEO AND LYRICS: The best love song to Michigan quarterback Denard Robinson you'll ever hear: Pat Stansik loves Michigan football, comedy and music. But most of all, he loves Michigan quarterback Denard Robinson. Simply put, here's what may be the best 2 minutes, 32 seconds of your day as the Ann Arbor band Mind's Eyes sings Stansik's tribute to Robinson, who has 3,229 rushing yards, 4,931 passing yards and a combined 75 touchdowns rushing and passing in his career at Michigan. 2. Renewed emphasis on 'backyard' helps Michigan flip in-state football recruiting battle with Michigan State: When Brady Hoke was hired as Michigan's coach 13 months ago, he immediately proclaimed a renewed emphasis on Midwest recruiting, starting here in Michigan and also Ohio. His first class illustrates just how successful that philosophy can be. 3. 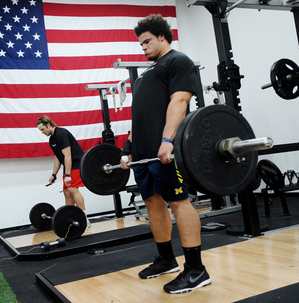 Michigan's Mike Martin staying mum on combine goals, except one: Set bench press record: There is one goal he's made very clear: He wants to be the first player in combine history to reach 50 reps in the bench press (225 pounds). 4. WITH GALLERY & VIDEO: A look inside Michigan basketball's new crown jewel: The Player Development Center: The facility, which was opened up for a media tour on Tuesday, is still without a few of its bells and whistles. From a functionality standpoint, however, it's officially become the new home for both the men's and women's teams and coaching staffs. 5. Michigan quarterback Denard Robinson is third-best Heisman Trophy candidate, according to noted oddsmaker: It took Denard Robinson just two starts to propel himself into Heisman Trophy consideration. Now heading into his third season as a starter, Robinson has yet to become a Heisman finalist — although one noted oddsmaker gives him a good shot at getting to New York as a senior.